Hanazono Resort | Hanazono Resort | Ecosign Mountain Resort Planners Ltd. Client Pacific Century Premium Developments Ltd.
Nihon Harmony Resorts KK (NHR) purchased Hanazono Resort in Kutchan, Hokkaido from the Tokyu Land Corporation in 2004. The following year, Ecosign Mountain Resort Planners completed the 2005 Resort Master Plan for Hanazono Resort, which was a report focused on the base area development with a basic review of the existing ski area capacity. NHR was acquired by Pacific Century Premium Developments Limited (PCPD) of Hong Kong in the fall of 2007. 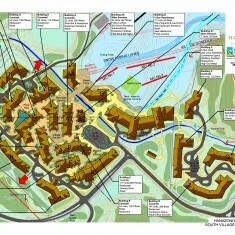 In September 2007, NHR requested that Ecosign complete an update of the 2005 Hanazono Resort Master Plan, including a review to adjust the design to the specific needs of the new owners. After the completion of the November 2007 Master Plan concept report, Ecosign was appointed as the lead planner of the base area master plan project for Hanazono. 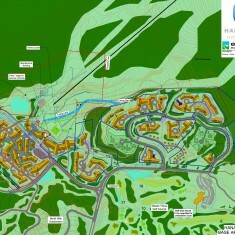 Over the course of the period from January 2008 through October 2009, Ecosign has worked with PCPD and HRN on the concept development and envisioning of this January 2010 Resort Master Plan for Hanazono. The total commercial space in the village will be approximately 10,000 square meters, including skier services. In addition, there will be commercial space located in two proposed upscale hotels. There is a proposed 5-star hotel located along the village snow front with a GFA of 50,000 square meters and 260 rooms that currently has a program for approximately 8,000 square meters of commercial space. A proposed 6-star hotel (30,000 sq.m. and 150 rooms) is located away from the village, higher up along the ski course with views that will have the village in the foreground and Mt. Yotei (the iconic “Mt. Fuji of Hokkaido”) in the background. The proposed 6-star hotel will be connected to the Hanazono Village by a pulse gondola for day time and evening operations. The base area development plans were completed to a level of detail suitable for the local development approval process, at which point the project was passed on to a Japanese engineering firm. 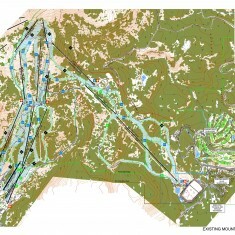 In early 2010, Ecosign completed a Resort Area Master plan for the Hanazono ski area, including a feasibility study of the surrounding ski terrain. The plans for the Hanazono base area development were approved in 2010.